You've got a mind - use it! If you've got questions - ask them! But don't fill your mind with rubbish and it is important to ask the right questions. So how do you make sure that you're headed in the right direction? Well - THINK, ASK - BIBLE! God's Word is the crucial ingredient. Read it - study it - learn it - think about it. God's Word will help you with your questions about family, friends and other important stuff like work and worry, troubles and trials and even your body. Find out about how David, Jonathan, Joseph, Martha and others experienced the same issues you do every day of your life - and how God is the same all powerful God for you as he was for them. 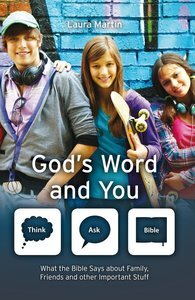 About "God's Word and You - What the Bible Says About Family Friends and Other Important Stuff (Think, Ask - Bible! Series)"
Laura Martin trained as an occupational therapist and is a busy mum. A native New Zealander she is associated with Grace Community Church Sun Valley CA.